We recently made some of the most delicious chocolate/peanut butter cupcakes with three variations. All three were good, but I’m only going to share the full “recipe” for the best. (See past the back story for the recipe). Anyone who knows my husband knows he’s not much of a sweets person so I was a little surprised when he picked up Fun Da Middles from Betty Crocker. I had been wanting to try the cupcake with a fun, creamy inside for a while but didn’t want to eat a whole batch to myself so didn’t suggest it. He even picked the best flavor option, which was the creamy chocolate icing in the vanilla cake. We both loved them and John even ate way more than I did during the week. We love to experiment with finding new ways to make foods we enjoy and John was fascinated with the idea of a chocolate/peanut butter version. We researched it online and most suggestions were to take already sugary peanut butter and add more sugar to it. Yuck! So we decided that I would decide between peanut butter or peanut butter cups (thinks Reeses but we got store brand) when I got to the store. I couldn’t decide so I um, just got both. Chocolate and peanut butter go great together-no icing needed! Peanut butter (crunchy is our preference, creamy is probably fine too. We like the added texture). Fill the cupcake holders with the remaining better, being careful to not overfill. Bake for the lowest amount of time allowed on the cake box. Like if it says 18-23 minutes, go with 18. Cooking too long will make it dry out and taste funny. 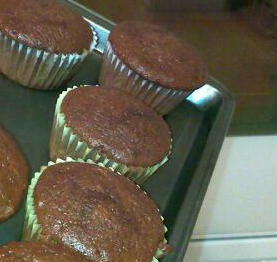 Let the cupcakes cool longer than normal because the innerds will be hot.